“I’ll have to withhold judgement…the organisers haven’t been very forthcoming” one Extinction Rebellion activist said, when asked about the group’s plans to shut down public transport in London on Wednesday. “There’s been quite a bit of debate about whether it’s a good idea,” another told me. “I fully support the actions of ER so far…[but] it would be counterproductive to the cause to try and disrupt the tube and train networks,” wrote green activist Tom Chance on Twitter. Green London Assembly candidate Zack Polanski joined Sadiq Khan in opposing the new tactics. 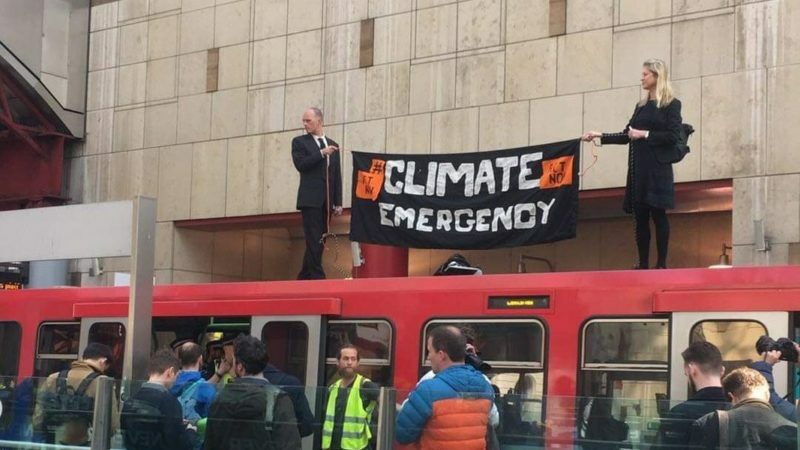 In fact, of the ten or so Extinction Rebellion activists I spoke to – activists in the sense that they were actually occupying a bridge – none seemed too keen on shutting down the tube. Whatever you think about Extinction Rebellion, the recent shift in tactics – moving from occupying bridges and squares to shutting down public transport – has divided opinion in the movement and outside of it. They demanded that the ‘government must tell the truth by declaring a climate and ecological emergency, working with other institutions to communicate the urgency for change’. The call is spot on. And it would be trite to automatically condemn the action on the grounds that ‘public transport reduces emissions’. The point of direct action is much bigger than a single event itself. It is about garnering maximum attention and creating maximum disruption. You do, however, have to bring the public with you. And repeatedly stopping millions of people from getting to work increases the likelihood of losing friends and alienating people (particularly if the immediate impact – increasing car journeys, in this case) is visibly counter-productive. When 200 Extinction Rebellion activists were arrested for blocking bridges and occupying public squares, the public appeared broadly behind them. Hell, even the media coverage has been broadly positive. The Times welcomed the movement (while criticising their tactics). That support shouldn’t be taken for granted. Direction action is always a balance between grabbing attention and annoying people. But you need to annoy the right people. When fracking activists shut down fracking sites, it is easy for the wider public to endorse (while being highly effective). When you shut down the tube – which is expected to host a billion journeys this year – that lack of focus can be counter-productive. I support the campaigners and the cause. But those in influential positions in the campaign must think carefully before throwing away public support. Block City Airport. Take over Parliament Square. Occupy coal plants and luxury car company HQs. Don’t block the majority. In a movement with no formal democratic levers, a silent majority in the group may struggle to force a rethink. It’s worth a try, though. I don’t see anything on yougov at all to do with them. Link welcome. They’ve from the beginning disrupted most of the central London bus network by blocking roads – don’t see the distinction between buses and trains. According to the YouGov web site, 30% of those giving an online opinion strongly opposed Extinction Rebellion. I think nhsgp makes up a lot of what it posts. Now I just want to go and burn tyres in my backyard while grilling more burgers than I’d actually be able to eat and lobbying the government to increase pollution – just to spite them. The people talking about disruption to their commute really need to get a sense of perspective – this is a fight for the survival of the species.